Oaxaca, in southern Mexico, has the highest proportion of native peoples in the country, and traditional culture is alive to such an extent that an estimated 50% of indigenous people are unable to speak Spanish. The state’s unique geography and multiple climatic zones have allowed pre-Columbian practices to persist largely undisturbed into the modern day making it a veritable living ark both for biodiversity and for those wanting to understand Mexico prior to the arrival of the Spanish. In fact, so ancient are Oaxacan traditions, that it is believed to be among the oldest continually inhabited areas of the Americas with archeological evidence suggesting the first peoples may have arrived around 11,000 BC. More recently, Monte Alban, an enormous citadel built by the Zapotecs, until it was overrun by the neighboring Mixtecs, was once home to 25,000 people, and among Mexico’s largest pre-Columbian cities. These two remain Oaxaca’s largest ethnic groups, and the traditional diet of the region still closely resembles that of their pre-colonial forebears in its reliance on corn, beans, chocolate, chiles, insects and wild game. Yes, it is here in the wild hills and deep valleys of Oaxaca that intrepid foodies go to gorge on piles of shiny, comal-toasted grasshoppers (chapulines) seasoned with garlic, lime juice and salt containing extract of agave worms or dusted with chile powder. However, there are rather more conventionally-toothsome victuals native to Oaxaca that can be enjoyed without any initial revulsion. These include more than 200 recipes for mole, tlayudas (a sort of flat-bread topped with melted Oaxacan cheese), and all manner of tropical fruits. Indeed, apart from its eponymous cheese, Oaxacan cuisine is considered by many in the know to be among the “purest” forms of MesoAmerican cooking because it has incorporated so few European ingredients. For most people, mole is the thick, gloopy stuff they know from their local Mexican restaurant that usually comes slathered over a pile of folded, cheese-stuffed tortillas or as a heavy-handed condiment to a lump of chicken or turkey breast. In Oaxaca, where the sauce originates, it comes in at least seven common varieties ranging in colors from black to yellow, and may include up to forty different ingredients, and, however it is served, it is the sauce not the protein that predominates the dish. Happily for us, and indeed you, there are more approachable dishes in the Oaxacan canon for the humble home cook to attempt. Among them is perhaps one of Oaxaca’s most common breakfast foods: enfrijoladas, which to the uninitiated, or easily fooled, may appear, on the plate, at least, to resemble a black mole. 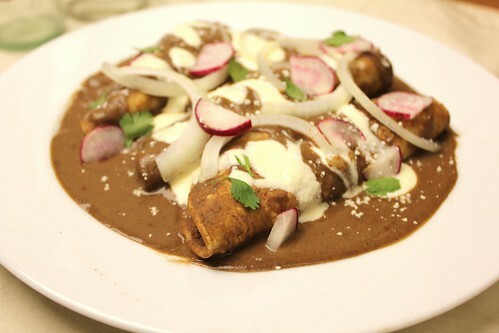 Meaning literally “in beans” or “beaned”, enfrijoladas are a cousin of the better-known enchiladas – in which some form of protein is wrapped in tortillas that have been first fried and then dipped into a chile sauce. (American versions come topped with an immoderate serving of grated cheese, but this is completely non-traditional, and as with mole, it is the sauce that really makes an authentic enchilada.) 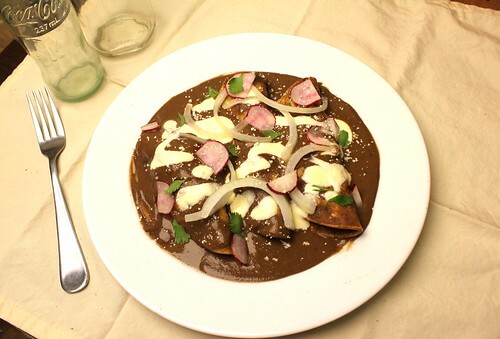 Indeed, as with mole, Oaxacan enfrijoladas have a wonderful complexity from the dark, velvety sauce. Black beans, a Oaxacan staple, are stewed with garlic, Mexican chorizo (not traditionally), avocado leaves, and/or hoja santa, creating an intoxicating mix of flavors culminating in an ineffable perfume of anise, and a faint bitterness. When served over tortillas stuffed with fresh cheese or squash blossoms, or even shredded chicken or pork, and topped with Mexican crema, white onion rings and, since it’s typically a breakfast dish, a fried egg, a dish of enfrijoladas leaves you surprised that something so extraordinary could be made from something as base as a can of black beans. 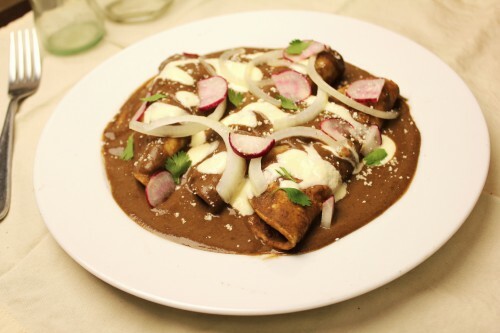 Other regions of Mexico have their own versions of enfrijoladas in which different bean varieties are used, and the same basic preparation is followed, so you may find red or even brown enfrijoladas from time to time. We did not follow the traditional method for Oaxacan enfrijoladas strictly, but of all the beans we’ve tried, black beans create the silkiest sauce, not to mention offering the most beautiful outcome with its binary contrast of black and white. In a large skillet over medium heat, cook Mexican chorizo until crispy, breaking it up with a spatula as you go. When nicely browned, add garlic and cook in chorizo fat until softened and fragrant. Add canned black beans, avocado leaves and pinch of hoja santa (optional). You’ll probably also want to add about half a can of additional water to give the beans enough liquid to stew in. Cook over medium heat for 6-10 minutes, or until starting to thicken, and room smells faintly of anise. Scrape bean mixture into a blender jar, add 1 or 2 chipotles depending on the level of heat you want, and pulse until you have a thick slurry. Add 1/2 cup of chicken stock and blend until mixture is as smooth as you can get it. Return mixture to skillet or a saucepan, and add remaining stock, stirring well to combine. In a separate skillet, heat 1 scant tablespoon olive oil over medium-high heat, and starting with one tortilla at a time, cook it until it starts to brown, puff-up and get a little crispy. Using tongs, carefully dunk heated tortilla into the bean mixture before taking it to a plate, stuffing it with cheese and chopped chicken/pork, and folding in half. Repeat this frying, dunking and assembling process until you’ve got three tortillas per person assembled on plates. Then ladle as much of the bean sauce as you want over the tortillas. I like mine saucy but not drenched. In a small bowl, thin the Mexican crema with the lime juice before dressing the enfrijoladas with the mixture, onion rings, and radishes. Serve immediately. That looks to die for. It’s not easy to find good authentic Mexican recipes and there are so many different ways of making mole sauce. There is so much out there I need to try. Thanks for sharing the recipe. @RS(d)OC: it’s kinda crazy how much of what is traditionally Mexican hasn’t really made it to Mexican restaurants in the US. Then again, that’s pretty much true of any cuisine, I guess. Bean sauce may be a tough sell for a lot Americans but it’s really frickin good! I’ve never heard of (or seen to my recollection) avocado leaves. Will have to check next time I go to Latin markets or someone’s home who has an avocado tree. Dish looks delicious and joke wasn’t bad — I laughed. @Joan: We bought some a while back at a Mexican grocers without really knowing what we were going to do with them. Finding a use for them in this dish has been a revelation. They have an incredible flavor and perfume that is nothing like what actual avocados smell and taste like. It’s a bit like a very mild and slightly bitter tarragon. P.S. – thanks for laughing that the joke. There is something rather charming about crap jokes, isn’t there? I actually thought your joke was way funny. I’m just that kind of girl, I guess! @quicksilva: thanks for visiting and for liking our joke! You’re right the hoja santa was dried and bought at the same Mexican grocery store as the avocado leaves. In fact, searching them out is a good excuse to pay your local Mexican grocers a visit. We have a couple near us and they always have one or two things that we don’t really know what to do with. We found popalo the other day and are wracking our brains about what to do with it before it goes off. @Jack: you could sub in a good pinch of Mexican oregano which has a slight minty quality. It won’t be the same but it will be good. You could also try a pinch of dried tarragon but I’d be careful since the flavor may be too strong. In truth, providing you put the soft Mexican chorizo in there you don’t need the herbs since it is already seasoned with cloves and oregano.